As the world’s most popular sport, football has no shortage of self-proclaimed experts who are (perhaps overly) confident in backing the right teams on a weekly basis. You know the type – the bloke in the pub who thinks he knows it all…but never wins a penny! The majority of bettors will base their bets on their weekly consumption of football-related news and views across various media, of which there is a huge amount given the saturated coverage of the sport. If the news is out there for everyone to see, you don’t have an edge. Unless you hear the news before it breaks – or as it’s breaking – the markets will have already adapted. The real advantage when it comes to football betting lies with those who take the time to learn to read between the lines and correctly interpret the finest of details. In this guide, we’re going to reveal our expert football betting tips from every angle imaginable. If we’ve not covered it here, it’s not worth knowing about! 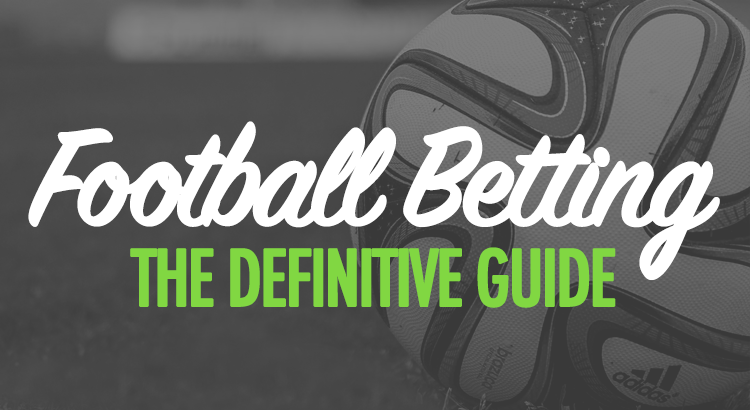 In total, there are over 5,500 words of expert football betting tips in this post. It is jam-packed with useful and actionable tips, but it may take multiple reads so that you can ensure all of the information has sunk in. Why the Premier League over Cup Competitions? In this section, we’re going to be looking at the main football markets you can bet on. We’re also going to consider the reasoning behind why you’d place a bet on any of the markets. If you’re already familiar with the types of markets you could be betting on, you can click here to skip to the next section. You have an option for each team to win the match within 90 minutes (plus stoppage time), and an option for the draw. Three options in total. Win-draw-win is the most commonly bet on market in the whole of football. This is because picking the team that you think will win a game often requires less thought than some of the other markets. People can often make a snap decision on who they would predict to be victorious in a match. These quick decisions commonly come down to personal biases and a team’s form over the last season, or last few matches. Within this football betting guide, we’ll try to help you remove these biases from your thought process. This will help you make better picks on every market – particularly the 1-x-2. With significantly lower odds than the market above, double chance allows you to cover two of the three outcomes in a football game. This means you can back the home team or draw, away team or draw, or either team to win. Whilst you will win on this market very often because the outcome likelihood is high, the odds are low and they often factor in quite a large bookmaker margin meaning you will actually be at a loss in the long-term. You will have to find some extremely smart picks in order to be profitable in the double chance market. We’re not saying avoid it, we’re just saying it’s hard to find real value. This is because the bookmaker overround is typically larger in this market. This guide will aim to reinforce the idea of ‘finding value’ so that it becomes second nature to you when betting. This is without doubt the most critical thing you need to consider when betting, but we’ll look at that in greater detail a little later. In this market, you will be betting on whether a match will have over 2.5 goals (i.e. 3 or more to win your bet) or whether it will have under 2.5 goals (zero, one, or two goals would win your bet). Depending on the teams in question, odds in the over 2.5 goals market – in league matches – will typically range from as low as 1.2 (1/5) up to a peak of around 2.5 (6/4). You would find those extreme odds in matches featuring high-scoring teams like Barcelona or Real Madrid playing weak defences, or in the opposite scenario you could have two low-scoring, defensive teams playing one another. On average, the odds in the over 2.5 goals market will be around 1.8 (4/5). This market can be a little easier to find value in for those that have a good sense of how a match will be played out – even if you aren’t sure who will be victorious. You will also find markets commonly offered pre-match for 0.5, 1.5, 3.5 and 4.5 goals – with the first and last markets in that list typically being the highest odds – but the 2.5 goal market is by far the most common to bet on. The correct score market is one of the hardest to accurately predict. This is highlighted by the SkyBet Super 6, whereby they award a £250,000 (or occasionally £500,000) prize to anyone that correctly guesses six correct scores out of six chosen matches each week. There have only ever been a small number of winners. The difficulty in predicting the outcome means that you’ll get high odds – but remember, this doesn’t necessarily mean high value. Correct scores often have a very high bookmaker margin. As previously mentioned, this makes it tough – but not impossible – to become profitable in the area long-term. There will also be huge variance due to the nature of betting at long odds. Over 40% of games finish 1-1, 0-0, or with the home team winning 1-0 or 2-1. Growing ever-more popular thanks to the Asian gambling market is handicap betting. With a ‘handicap’, this type of bet aims to level the playing field between two teams – typically a strong team will have a -1.5 handicap against a weaker team, who will in turn have a +1.5 handicap if you wished to bet on them. In simple terms, you’d need your team to win by two goals or more when betting with a -1.5 handicap. If you chose to bet on the +1.5 handicap, you’d win your bet as long as your team won, drew, or lost by only one goal. There are greater handicaps available too, but the above is the most common and the odds will typically hover around evens for both selections – depending on the two teams in question, obviously. In the half-time/full-time market, you are betting for a team to be winning, drawing or losing at half-time, followed by them to be winning, drawing or losing at full-time. This is not the same as winning, drawing or losing both halves. If you bet on a team to win both halves and the result was 1-0 at half-time and 1-0 at full-time, that bet would lose. If you had bet on that team to win half-time/full-time, the above result would be a winner. Your best chance in this market is to go for the increased odds (compared to just a standard ‘match result – win’ bet) if you think a team has a good chance of starting strongly and seeing a result through. There are hundreds of total markets in football betting, both pre-match and with additional in-play markets too. Some of the most popular that we won’t be covering in more detail are the likes of First Goalscorer, First Team to Score and Scorecasts (first goalscorer odds multiplied by correct score odds). It is quite common that the higher the odds are, the higher the bookmaker margin (and therefore the lower your ‘edge’) is. The First Goalscorer market is known to have particularly poor odds outside of the favourite – and especially so on midfield and defensive players. There will be markets out there that you can make profitable if you specialise in them. If you follow the football bookie bashing tips listed throughout this entire guide and apply them correctly to markets that you master, is it possible to become a profitable punter. Just because it is possible, it does not mean it is probable. Take your time, learn, improve, analyse, be sensible and be disciplined. Accumulators are where you combine multiple selections from one or more markets (such as multiple teams in the ‘match result’ market) and the odds will be multiplied by each other and then your stake to create a potentially massive payout. We aren’t going to cover accumulators – or accas – in any real detail here; unless you hit a fluke big win in a small sample size, they are unlikely to be profitable for you over any reasonable length of time unless you are exploiting acca insurance. Above, we spoke about value multiple times. It’s essential that you learn not just to bet when you believe there is value, but also learn to find value as well. The image shows the most commonly bet on correct scores in the match and the odds that many major bookmakers are offering on each selection. If the odds are listed in bold, that means the bookmaker is top price in the market for that particular score. These are shown in decimal odds. Decimal odds are essentially just fractional odds plus one, so 7/1 = 8.0 and 8.5 = 15/2 etc. Draw 1-1: Top Price 8, Average Price 7.4, Betfair Exchange 8.6. Spurs 2-1: Top Price 9, Average Price 8.5, Betfair Exchange 9.8. 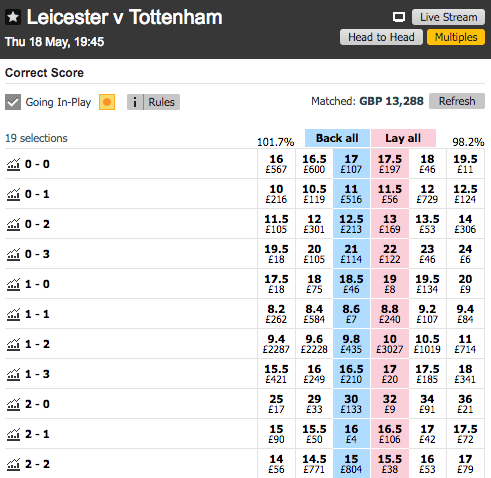 Spurs 1-0: Top Price 10, Average Price 9.2, Betfair Exchange 11. Spurs 2-0: Top Price 12, Average Price 10.2, Betfair Exchange 12.5. Draw 2-2: Top Price 15, Average Price 12.7, Betfair Exchange 15. Leicester 2-1: Top Price 15, Average Price 12.8, Betfair Exchange 16. Draw 0-0: Top Price 16, Average Price 13.3, Betfair Exchange 17. Please note, we have taken the ‘average price’ figure from the odds shown in the Oddschecker screenshot above. Whilst this does not include all bookmakers in the market, the average is actually slightly higher in this instance than the total available average. The only downsides to Betfair Exchange is that they take 5% of your profit on winning bets as commission (they aren’t a bookmaker, so this is how they make their money) and they obviously don’t offer the perks or promotions that a regular bookie would too. Because of the commission, you’ll notice that sometimes we’ve highlighted lower odds as the better price (see: Spurs 1-0, Draw 2-2, Leicester 2-1, Draw 0-0) because it works out as more profitable after fees. With the main odds in the correct score market, Betfair Exchange is the outright top price (after commission) in two of the seven markets. If you were to use Smarkets instead of Betfair – a similar product but with just 2% commission – it would be significantly more profitable again. If you don’t have a Betfair account, you can sign up here. Alternatively, click here to sign up to Smarkets and receive a £10 cash refund on your first losing bet. The exchange is significantly higher than the average odds available in all markets. An individual bookmaker may be best odds on one score in particular, but rarely (or never) will they be the best across all markets. Whilst you should seek to take the best price on any selection you make wherever possible, this can sometimes lead to accounts becoming restricted. When bookmakers realise you’re too savvy for them, they can be known to go on the defensive and look towards stake restrictions and/or gubbings. Everything we’ve just told you is not specifically about how to find value in football betting. However, it should highlight that you should be taking the highest value possible in all circumstances. To find true value, you have to think smart. In fact, you have to think so smart, that you have to try to think smarter than the market as a whole – after all, it’s the market that typically decides the odds, especially on the exchange. As you bet more often, you will probably find it much easier to spot value. Value does not mean you will win every time. What it does mean is that – over time – the picks should end up in profit. Don’t be downhearted if you think you keep finding value but then go on a losing streak. It can be tough to battle through, but doing this is essential if you want to see the long-term positive results. Let’s say that Arsenal played last week, and they started the match at odds of 2.0. They were playing away against 12th in the league, their star striker was suspended, and they went on to lose the match 1-0 – despite dominating in both possession and shots. Their next match is away again – this time against 11th in the league, and this team happens to have a very similar playing style to the team that Arsenal previously lost to in the match shown above. Their star striker has now returned from suspension. Their odds before this game (and this is completely hypothetical) are now 2.1. Do you think this represents value? From the outside – without digging further into statistics – we’d say that it does. Their chances of winning this game have increased from the previous match thanks to their best goalscorer returning, and they were unlucky not to win the previous match even without him. Despite these facts, their price has gone up. It’s this type of information you need to be analysing. Do you think the rest of the market have failed to pick up on something? Act on it! This is just a very basic overview of finding value because it’s so hard to teach. You really do have to pick it up yourself as you go along – but we’ll give you some further pointers on finding value bets a little later in this guide. You will be betting very small percentages of your bankroll on football. It is too unpredictable and losing streaks can occur. It’s vital that when you hit a losing streak, you have enough left in the tank to battle your way out of it. There are a huge range of different sources that you can use for your pre-match betting statistics. We’ve spoken already about value, but how do you find value? By researching a team and a fixture, you can make judgements over how you think a particular game should pan out. If an opportunity presents itself in-play, you should be in a good position to judge whether a bet seems logical, and therefore profitable. TOP TIP: Remove all emotions when betting, keep a level head and try to not let any bias cloud your judgement. It’s essential to not just look at whether a team has won, drawn or lost recently, but also look at the quality of teams that they’ve faced in their previous games too. Also look for any particularly strange results and try to work out why they occurred – will the reason be the same this time around, or was it a one off? A team might be in great form on paper, but do the stats back up those results? A team could win three matches in a row, but only have one shot and 20% possession in each – essentially getting lucky. Use sites like WhoScored & Soccerway to look at how many chances a team creates and concedes on average to reinforce your decisions, along with analysing how they typically create chances. Create or concede chances from open play often? Score or concede from set pieces regularly? Your first port of call is to get to know the strengths and weaknesses of teams in specific leagues. Some teams will be prolific in front of goal, while others will rely on a strong defence. These stats are easy to find. Leicester City’s stunning title run in the 2015/16 season was built on solid defence, and the likes of Tottenham and Manchester United were also renowned for keeping clean sheets. Naturally, this often translated to them being involved in low-scoring affairs. It may take some time into the season to accumulate the relevant data, but don’t hesitate to reference previous seasons if the manager has stayed the same and there haven’t been too many transfers made. The stats that aren’t as easy to find – although some can be highlighted on WhoScored – is the styles of play that teams prefer to play against, or struggle against. If you know that a team struggles against pacey sides, or physical sides, but the market doesn’t reflect it…you may have spotted some value. Statistics do not always tell the full story and taking them at face value can lead to an oversight of the reasons for a team or player enduring a form slump. One of the reasons that the statistics don’t always add up is scheduling, the importance of which is commonly overlooked. Researching a given team or league’s schedule is crucial as it will help you spot tough runs or busy periods where fatigue could come into play. Many of the top teams face hectic schedules due to continental club competitions such as the Champions League, and these same teams can play over 50 games during the course of the season when domestic cup competitions are also taken into account. Midweek fixtures for these sides are quickly followed up by weekend fixtures, and a busy schedule can open the door for an upset, particularly when teams have to endure a lot of travel within a short period of time. Opportunities to bet based on schedules can also be league-specific. In the English Premier League, for example, there is no Christmas break, rather an abundance of fixtures for each team to negotiate across the end of December and start of January. It is no surprise that certain teams falter during this period while others enjoy a spike in form. There are plenty of upsets, too, so the informed and savvy bettor should spot the value and wager accordingly. It’s vital that you know exactly which players will be available for any given game. Are key players ruled out, or are they likely to be rested for any reason? This is a massively underrated factor that is often overlooked in football, but it’s often key when betting in-play. It’s your job to work out whether a team will fight until the very end of a game…or even if they’ll fight from the start at all based on their current motivations to achieve a result. There are no shortage of competitions to bet on in football, so narrowing down the list is crucial in a successful football betting strategy. Given the multi-tiered set up of football competitions across the globe, there are several leagues to bet on in each country, making it crucial to focus on ones that you have a sound knowledge of and are easy to follow rather than betting across a wide spread. Covering a large amount of leagues internationally would require an excessive amount of time to do your research properly. That time and effort could be better spent on developing expert knowledge of a small list of leagues, as opposed to a general understanding of a wider spread. You might already have a good understanding of a particular league by account of supporting a certain team, so that is a good starting point. Most football fans will also keep a keen eye on other competitions, particularly those that garner international attention. Generally the top divisions across Spain, England, Germany and Italy fall into that category, so that is another foundation on which you can build your strategy on. Yet if you happen to have a sound knowledge of less popular leagues, do not hesitate to bet on them. You will find plenty of value in a market that is not as hotly contested as the others. Unlike get-rich-quick schemes such as the lottery, sports betting provides people with the opportunity to control their investment. People’s decisions, not a random draw, determine winning or losing. Naturally, people gravitate to what is mainstream and at the forefront, thus it’s no surprise that betting on football is amongst the more popular forms of sports betting. Given the sport’s global reach and widespread media coverage, not to mention the huge range of betting options offered for each game and competition, punters simply can’t get enough of it. But not all football competitions should be treated the same by bettors; each has its own particularities that lead to unique patterns of play and outcomes. The English Premier League, the world’s most popular domestic football competition, is no exception. Here, we guide you through some of the specifics of betting on the English Premier League and offer up some strategies that can help you make it one of the most profitable competitions you bet on. The English Premier League is a perfect example of a popular league with various avenues available for securing matchday information along with team and player statistics for free. The league receives more media coverage than any other, largely by account of a multi-billion-pound television rights agreement that sees it broadcast into more living rooms and pubs than any other league in the world. This is just one way of sourcing your statistics, but there should be others. The English Premier League’s official website is another good resource for league-specific coverage and also includes the popular Fantasy Premier League game, played by millions worldwide, which offers even more refined information that can be applied to a betting strategy. There are a host of other websites that detail the key statistics and fixtures that you should be aware of, so look far and wide. It’s much easier to find statistics for Premier League betting tips than it is when looking for lower league betting tips. Once you have gathered the information, the next step is to learn how to apply it to the specifics of the league itself. Also, be wary of the managerial merry-go-round that can take place in the English Premier League. The stakes are high in the world’s richest football competitions, and managers are often cast aside when teams underperform. From a betting perspective, this can be viewed as opportunity. A common occurrence is for a struggling team facing relegation to have a change of manager during the season and turn their fortunes around. All of sudden, lower-table sides start picking up draws or causing upsets, all at very attractive odds. Sunderland were the case in point in 2015/16 when they escaped relegation under Sam Allardyce, but there are countless other examples. While a change of manager doesn’t always work, when it does it can leave the bettor with the opportunity to make valuable bets on a team’s revival. In short, the form lines stack up more consistently in the English Premier League than they do in cup competitions. The FA Cup, despite its rich history, is often a distraction for the top teams, who will field weaker sides during the earlier rounds, and the same is even more true of the League Cup. The same applies for English Premier League teams taking place in the Europa League; they simply don’t take the competition as seriously as they do the league. Granted, the above examples present an opportunity to back certain teams at good value, particularly in the case of the FA Cup where lower-league teams can make audacious runs into the later stage of the competition. The Champions League, on the other hand, is at the forefront of any English Premier League team’s aims for the season, yet picking the correct outcomes here can be difficult given the amount of quality sides that take part in the competition. It’s the domestic league where a team’s form line can be best gauged. Put simply, there is generally much more to play for. Certain teams are fighting for survival, others want to qualify for European competitions and the best fight it out for top honours. With each match having plenty riding on it, you can feel assured that teams go into them seeking the best result possible. The same can’t be said of the cup competitions that can clog the fixture list. That should give the bettor confidence that the research on the English Premier League will be backed up by the performances on the pitch. Whilst the Premier League does have upsets on a regular basis, it’s typically much more predictable to bet on than the likes of the MLS. With the spotlight ever-focused on the Premier League, lower leagues often find themselves lost in the background. We all know how it is – the big fish get all the spoils, leaving the little guys fighting for scraps. This is exactly how the world of football works: lacking resources and star-power, lower leagues have almost become the forgotten bunch, unless you’re a local fan. However, this same fact leads to no powerhouses in lower leagues that dominate for many consecutive seasons. Whether we like it or not, sportsbooks dedicate most of their time and energy to the EPL and the Champions League. Luckily for us, this leads to a tendency of mistakenly valued lower league games. Continue reading to find out how you can exploit the lack of attention lower leagues receive. It may be hard to find live broadcasts of many lower league games, with focus around the world on mainstream leagues like the Premier League, La Liga, Bundesliga and the MLS, but it’s crucial you watch as many as you can. Highlights only show so much, and you’ll miss the feel for how the match truly went. Watching matches builds instincts that you can use when football betting. If live broadcasts aren’t an option for you, at least read every article you come across. Use journalists and fan blogs for more important team-specific information. You’ll learn useful tidbits about injuries, recent performances, and transfers. Every bit of information is valuable when placing a bet. Home-away statistics greatly vary depending on the team, particularly in the lower leagues. Remember: many players aren’t professional at this level. This means some players may have to work a full or part-time shift close to matches, meaning away games can leave some players overly tired. There are some big teams in the lower leagues with large stadiums and fan-bases. Players lacking experience may find it intimidating to play at these locations, giving the home team a sizeable advantage. Consider the average age and experience of the away team players when they’re travelling away to large grounds. Inexperienced, younger teams can play with less fear but they can also be more likely to be nervous in the situation, so you need to work out whether a team is more likely to be fearful or up for the challenge. Lacking resources and star-power, often a single injury to a key player could change the fortune of lower league teams. Without having a surplus of talent, lower league teams with injuries are often forced to start subpar athletes. Keep an eye out for injuries to key players as these teams seldom have adequate replacement options. For the most part, the lower down the leagues you go, the worse the pitches are. Teams play a ton of games every year with various cup competitions coinciding with the league, and the weather doesn’t always cooperate. Unfortunately, teams in League One, League Two and the Conference are unlikely to be able to afford high quality ground staff, and a number of teams will share grounds with other sports teams – like rugby. Some pretty dreadful long-ball football. As much as you and I may dislike the school of thought behind such tactics, it often leads to higher scoring games. Charles Reep popularised the long-ball theory and suggested the ‘3-pass optimisation rule’, stating that a higher percentage of goals are scored in 3 or fewer passes. What does this mean for you? Long-ball tactics are most effective in lower leagues where players lack tactical knowledge and the ability to pass the ball accurately. This often leads to teams lining up with big, bulky, slow centre backs, as they’re most effective at dealing with long balls. With this in mind, it’s worth keeping an eye out for teams that possess a lightning-quick striker when playing on a pitch that is actually good quality – particularly if they’re coming up against a defensive partnership primed to deal with a long-ball game rather than pace in-behind. Poor quality pitches also fatigue players more quickly than a good quality pitch. Look towards teams that have physically fit players to stand a greater chance in these conditions. That which others may overlook is your window into value betting. Parity among teams opens a door to exploiting this overlooked niche. Sportsbooks may overlook certain teams, but their mistake is your opportunity. Low-profile teams, heavy underdogs, pitch conditions, and specialising in a league could all be used to increase your winnings. No-one is perfect and that holds true for bookmakers as well. To be a successful bettor, your job is to find markets where value is offered. Bookies cover too many leagues and it is impossible for them to gather all the information on every league out there. Pick a league and specialise in it, whether it is the Championship, League One, Two or even a more obscure league. Become the authority on it, learn everything there is to know. Once you know more than the bookmarkers on a niche market, the world is your oyster. The majority of the points we raised above are also true for the rest of the top European leagues. However, these leagues all have a winter break and that gives us unique betting opportunities in both the league and inter-European competition like the Champions League and Europa League. We will be returning to update this section in due course. You can check out our existing MLS betting tips post if you wish to find out specific advice for the biggest league in America. Betting in-play is one of the most popular and addictive choices in the world of football. We’ve compiled our in-play tips in a separate beast of a guide! How many times have you wanted to get on a bet and a goal has gone in just before you could place it? Or, how many times have you seen a game with crazy stats and wished you had seen them sooner? We use an insanely powerful in-play tool from Inplay Trading called Football Scanner. You can check them out and use their tool via this link. The Football Scanner monitors all in-play football matches simultaneously and provides all of the stats for you on screen at the same time. This means you no longer need to flick from match to match to view the stats. All stats update in real-time on your screen too, so you can see which team is pressing and looking likely to score. Our in-play bets have seen a huge increase in our success rate since getting our hands on this tool. Inplay Trading’s Football Scanner alerts you to every single game where a goal is likely to be scored. Using a unique statistic called ‘pressure index’, they can calculate when goals are most likely to be scored based on a match’s in-play stats. With this statistic, they will highlight every game where there is likely to be a goal and you can get your bet on before it’s too late. There are many other features too, but we’ve documented them in more detail in our full Inplay Trading review. The immense popularity of English Premier League betting means that punters can also take advantage of arbitrage bets. These are otherwise known as miraclebets, surebets, or arbs. Usually, betting on all outcomes at the odds offered by the same bookmaker is almost surely going to end up as a loss. Arbitrage bets, on the other hand, are about comparing the odds, for the same event, across different bookmakers and choosing the best odds for each outcome. Given the English Premier League’s popularity, there are plenty of odds to access and compare for each fixture. And this means it is possible to find a spread of contrasting odds that eradicate the chances of loss and offer up excellent returns. That’s if you do your research effectively, of course. Before you latch onto this betting strategy, It is important to remember that arbitrage does require stakes to have perfect weightage on all outcomes in such a way that the punter does not face a loss. There are risks associated with arbing though, such as find out what being gubbed means. We rarely opt for arbitrage betting ourselves, but if you would like to look into it for yourself then the betting tool we recommend for this is the oddsmatcher from Oddsmonkey. As a punter you’ve been through it all, the highs and lows, the jubilation and the letdowns, now you’re wondering what is next in store for you. If you’re well-versed in the strategies we’ve discussed, you’re one step closer to getting a leg up on the competition. Every action in a match has the potential to move the markets. If you stay on top of it, you could be on the road to consistent profits. Be confident in yourself, your strategy, and the research you have done. Remember, no-one wins 100% of their bets – not even close. It’s all about staying profitable.